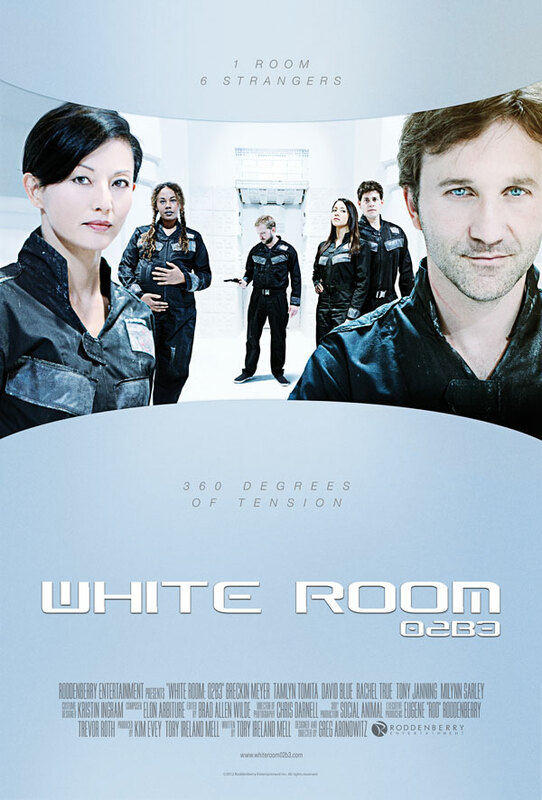 As for "White Room 02B3", Red Dot Diva thinks this sounds like a very exciting project by Roddenberry Entertainment. 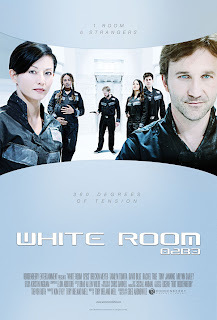 It is the first-ever 360-film, about 6 strangers who wake up in a white room and find themselves as part of some kind of crucial experiment that could change Mankind forever. It stars familiar actors like Breckin Meyer, Tamlyn Tomita, David Blue and Rachel True, as well as Tony Janning and Milynn Sarley. Unfortunately, the special screening held at The Birch: North Park Theatre on Thur, 12 July at 7pm is now FULL. But the event is still significant enough to be mentioned here, and Red Dot Diva knows of quite a few people who managed to sign up for the free screening. It's something she herself wouldn't want to miss. 2. 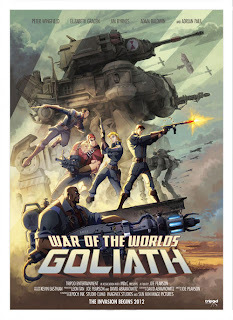 "War of the Worlds: Goliath"
As the world gets smaller and more connected, Red Dot Diva notices a more prominent trend towards an infusion of an East-West style in media and art forms. “War of the Worlds: Goliath" - a stereoscopic 3D steampunk action animation film embodies that notion. It is produced by Malaysian media company, Tripod Entertainment with creative input from industry veterans, like director Joe Pearson (Epoch Ink Animation), writer David Abramowitz (Highlander) and executive producer, Kevin Eastman (Heavy Metal). There is also the geeks’ squee-worthy list of voice actors like Adrian Paul (Highlander), Peter Wingfield (Highlander, X-Men 2), Adam Baldwin (Serenity, Firefly, Chuck), Mark Sheppard (Battlestar Galactica, Supernatural), Elizabeth Gracen (Highlander), Jim Byrnes (Highlander), Beau Billingslea (Cowboy Bebop) and many others. The film is about the return of the Martians invasion on Earth some years after a failed attempt back in 1899. Mankind’s new defense against the aliens lie in the rapid reaction force A.R.E.S, an international alliance equipped with steampunked Tripod battle machines. During the second Mars invasion, the battle team from Tripod “Goliath” go bravely head on against the aliens in another attempt to save Earth from utter destruction. CLICK HERE for the cool trailer, which shows a little of that heady mix of East-West story-telling! 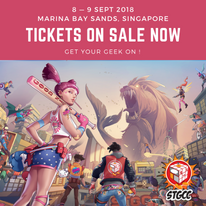 So stay tuned and check back here, as Red Dot Diva gets ready to reveal more information on how to snag those tickets, as well as other juicy dibs on this exciting animation film. 3. "Get A Life" and "Attack of the 50 Foot Cheerleader (3D)"
Another double-billed feature, one of which has almost unbreakable ties to "Star Trek" (again!). The original Captain Kirk, William "The Shat" Shatner will be presenting "Get A Life" at a Comic-Con panel together with Roger Corman's "Attack of the 50 Foot Cheerleader (3D)" on 14 July. 7pm - "Get A Life"
12 midnight - "Attack of the 50 Foot Cheerleader (3D)"
"Get A Life", a documentary by EPIX, is based on Shatner's book examines the mystery and motivation behind the long-running cultural phenomenon that Trekkies/ Trekkers immerse themselves in, especially in the world of fantasy/ scifi conventions. The movie will premiering on July 28 at 8pm EST on EPIX. Red Dot Diva feels movies like "Attack of the 50 Foot Cheerleader (3D)" are cheesy and not to her taste, but understands that such movies have their ardent fans. Who simply like BIG Things. Like Giant Pom Poms. In fact, the Roger Corman movie is an update of one such B-movie in the 50's entitled "Attack of the 50 Foot Woman" (which was wayyyyy before Red Dot Diva's time, if one really needs to know). Now, if you are wondering how did a cheerleader get to be 50 foot tall? Drugs, of course! The EPIX movie stars Jena Sims (The Vampire Diaries), Sean Young (Blade Runner), Treat Williams (Hair, Everwood), Ryan Merriman (Pretty Little Liars), A.J. Lamas (Leave it to Lamas), Mary Woronov (Eating Raoul) and Ted Raimi (Spider-Man). This is just about as weird and offbeat in terms of movie screenings as one can possibly get at Comic-Con. 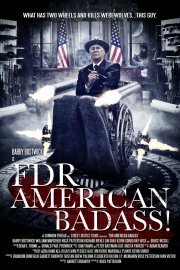 "FDR: American Badass" is a spoof in the likes of "Abraham Lincoln: Vampire Hunter" and will be released on DVD and VOD in September 2012. Over-top and just bloody baaaaad, "FDR: American Badass" stars Barry Bostwick, Lin Shaye, Kevin Sorbo, and William Mapother, with Barry Bostwick taking the lead role as the polio-ridden 32nd President of the United States. With his vehicle of choice - the wheelchair, watch fur fly as FDR kicks some werewolf butts in this slapstick comedy. The movie will be screened for the very first time at Comic-Con on 13 July, followed by a Q&A with producers Ross Patterson and Tristen Drew. Again, Red Dot Diva doesn't think she could watch the movie without trying to chew a cushion (or two), but she knows of many people who are actually looking forward to this film! So long as it is all fun and good, right? Thank you for the info. Already got my Trek ticket. Gonna be alot of screenings this year. 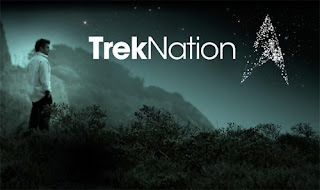 I'd have loved to watch Trek Nation!